On a cold November 2018 morning, the routine at the house of late Nanak Singh in Tral’s Khashipora area was usual. Santosh Kaur, his widow, was about to step into the courtyard of her house to put fire in the Kangris, when a grenade landed in the compound of their small wrecked house. It was a warning. 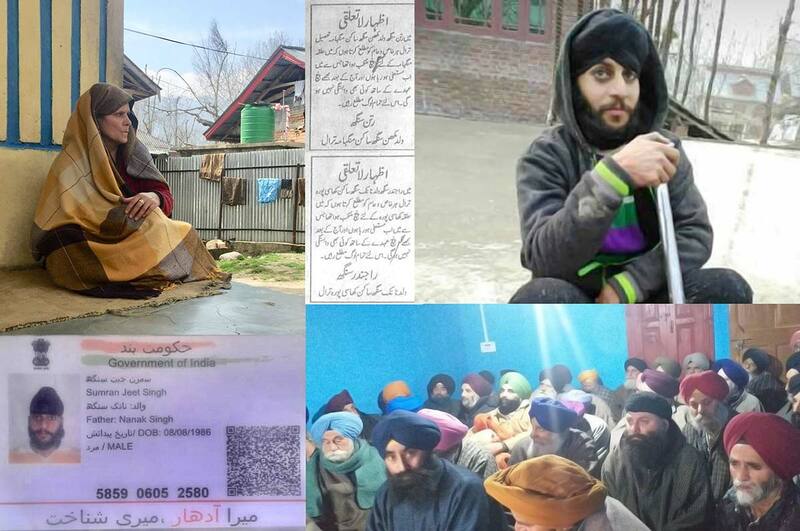 The grenade was lobbed a month after Rajinder, her son, was elected as Khashipora’s Sarpanch. Frightened, Rajinder straight away went to one of his Muslim friends and asked him to draft a letter in Urdu. Addressed to the Imam of the Jamia Masjid Tral, it was an apology on Rajinder’s part for participating in the elections and a resignation as Sarpanch. Rajinder, a Congress worker, symbolizes the south Kashmir’s political space, which is caught between death and democracy. As many as 19 Sarpanchs were killed in Kashmir since 2011 Panchayat elections. Post Burhan, the attacks by suspected militants against the members of unionist political parties in south Kashmir had even forced many of the political workers to migrate temporarily to Srinagar and Jammu. “Not the whole political fold, but yes, some workers along with some businessmen too had shifted to Srinagar temporarily,” Agha Roohullah Mehdi, spokesperson of Farooq Abdullah led National Conference said. Families of these political workers are the real victims of this “death and democracy game”. As for Rajinder, he thought that his resignation from Panchayat and putting an end to his political affiliations will cease the whole trouble. However, it did not end with this. A month after Rajinder’s resignation, a maternal relative, who lived a kilometre away from their Devar home, had died. Simranjeet Singh, 28, Rajinder’s younger brother and a professional driver, also the lone earner of the family, had gone to attend the cremation. Knowing that the cremation was getting delayed, Simranjeet decided to get his mother. He was on way to home when some unknown masked gunmen intercepted him and were shot at. He had four bullets on his body. No one came to his help. It was Simranjeet himself who despite being hit so badly made two phone calls, to his uncle and brother. “All he said on the phone was: please pour me some water, else I will die,” Surinder, who accompanied him in the ambulance to SMHS along with his brother and mother, said. “All my son could whisper was that they (attackers) were two and both were masked. I cannot live anymore. I am going to die soon, Simranjeet said just before he succumbed outside the hospital,” his mother Santosh said. With local youth picking up guns, south Kashmir has witnessed a sharp rise in militancy in the post-Burhan era. It has a direct bearing on unionist politics. Simranjeet’s killing saw a mass resignation of 30 sarpanches. But this was not the first such killing. Not very far from the house of Simranjeet, lived an old man named Ghulam Nabi Mir, in Batagund village, a former district Panchayat officer who chooses to be a Sarpanch. Mir was having his meals on the evening of April 21, 2014, when suspected militants shot him dead. Suhail Firdous, 19, Mir’s grandson, remembers everything. He was sitting outside the main gate, when the news of the killing of a PDP worker in the Amlar village, came. He got in and closed the main gate. He saw his grandfather having dinner as his father was with his other son. Then there was a shootout. Initially, the family thought it was the guard of the local Congressman. But a few moments later, they realized, it was happening in the house. Mir got a bullet in his head and fell in the plate from which he was eating. Suhail’s father Firdous got a bullet in his thigh. “Initially, we could not even open the door as we thought the militants were still outside and might kill us too,” Suhail said. “But finally, I gathered courage and opened the door. Abba was already dead and before I could take my father to the hospital, he too died.” His father was a Panchayat inspector. Now, Firdous was given a job in the Rural Development Department on compassionate grounds. Suhail, who had to quit his studies, now wants a better education for his brother Mouzin. The family does not pursue the case of the twin killing at home. “It’s a village and people here are soft targets,” Suhail said. “Next day, militants sent a letter to the local mosque saying they neither killed my grand-pa nor my father. Now, if at all Mouzin ever asks me who killed my father, all I say is ‘no one killed him. Just no one”. The August 2018, the killing of a BJP activist, Shabir Ahmad Bhat, after his abduction from his Rakh-e-Litter (Pulwama) home actually triggered the fear in the political class. That was the first killing after the government announced the municipal polls. The killing sent the entire political class seeking refuge in Srinagar. Are people willing to come out? “There is a silence which is horrifically dangerous,” Parra said. “No one really wants his name to be associated with the politics. No one knows what comes next in the life of a political worker.”. On a Sunday evening, a month after Burhan’s killing, residents in Bijbehara claimed four militants moved through several localities of the town. They allegedly targeted workers of the then ruling PDP, thrashed some of them and forced a few to tender an apology and announce resignations. “Four militants entered Baba Mohalla at around 9 pm and thrashed the PDP workers inside their houses with sticks,” one eyewitness said. “Later, they moved to other localities and attacked the PDP workers there as well.” Within a few days, eight PDP workers quit politics. Another resident who identified himself only with his first name Ghulam said that they (militants) had a list of all the workers along with them. “They read names after they approached many of us who were sitting by a shop in the new-colony locality that evening. The ones present there were thrashed with wickets. I was hurt too bad that I could not sit properly for days together,” he said.